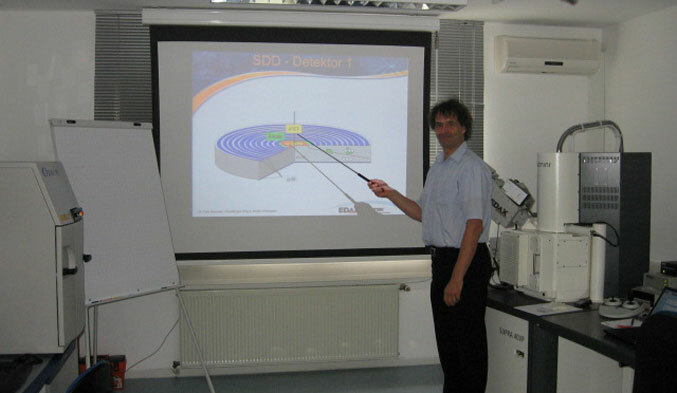 In Europe, we offer training courses in our Weiterstadt office (close to Darmstadt) in Germany. Training courses for EDS, WDS, EBSD, and XRF are offered in a modern training facility equipped with a low vacuum capable FEG-SEM. Courses are presented in both German and in English. This 1.5-day training course is designed for EDAX users to gain a fundamental understanding of the basics of EDS, with ample hands-on microscope time to learn the workflow and options built in to the APEX™ software. The two-and-a-half-day EBSD course (as part of a full TEAM™ Pegasus course) offers comprehensive training on TEAM™ EBSD, OIM Analysis™, and Delphi Phase Identification for both novice and experienced users of EDAX EBSD systems. The two-and-a-half-day EDS Microanalysis courses offer comprehensive training for users at all levels. The topics of the training classes will be the quantitative and qualitative Analysis, Mapping and Linescan. Related to these analytical methods theory, correct set up of measurements and post-processing of the data will be explained in detail. Please contact edax.training@ametek.com for further information. To further increase your knowledge on Micro-XRF and to get the most out of your Orbis system, EDAX offers a training course on demand. The course is specifically for Orbis users and covers both theory and physics of EDXRF, production and properties of XRF and effect of capillary optics on the primary tube radiation. Specific software topics include Qualitative and Quantitative analysis, fundamental parameters and intensity analysis. Imaging, mapping and Linescan are also addressed. The course utilizes informative lectures along with hands on lab and computer demos and customer sample analysis. The one-day Particle course is mostly offered after a TEAM™ training course. The course gives an introduction to the strategy of Particle Analysis with further detail using customer samples. The five-day EDS and WDS course focuses on both techniques and the advantages using both techniques together. The physical principles of both methods gives a better understanding of the electron beam analytical methods and explains how to use the software. Important topics are analyzing samples, strategies how to analyze, how to improve and any questions from the participants. The five-day EDS and EBSD course covers both techniques and highlights the advantages of using both techniques simultaneously. The principles of both methods are presented to give a better understanding of the analytical possibilities. This comprehensive training uses the TEAM™ software for EDS and EBSD data acquisition, but also includes EBSD post-processing and phase identification with the dedicated OIM Analysis™ and Delphi software packages.. Participants are encouraged to bring their own specimens and datasets for analysis and discussion. For a better understanding of WDS-EDS software, two and a half days are spent on advanced EDS and WDS. WDS should not be viewed as a stand-alone analysis technique, but should be used complementary to EDS.